PHUKET: It’s a quiet Sunday night in the middle of the Songkran festival. Cook Nai of the Nurisa Joke stand, is serving just one customer. A cook at the Nurisa Joke stand serves up a hot bowl of goodness to take home. His stall is located next to a big 7-Eleven on the right hand side of Viset Rd, as you head south to the pier at Rawai Beach. The usually busy nearby Rawai market is packing up as well. There are not many people around, with many residents travelling home to other provinces to visit families and relatives. 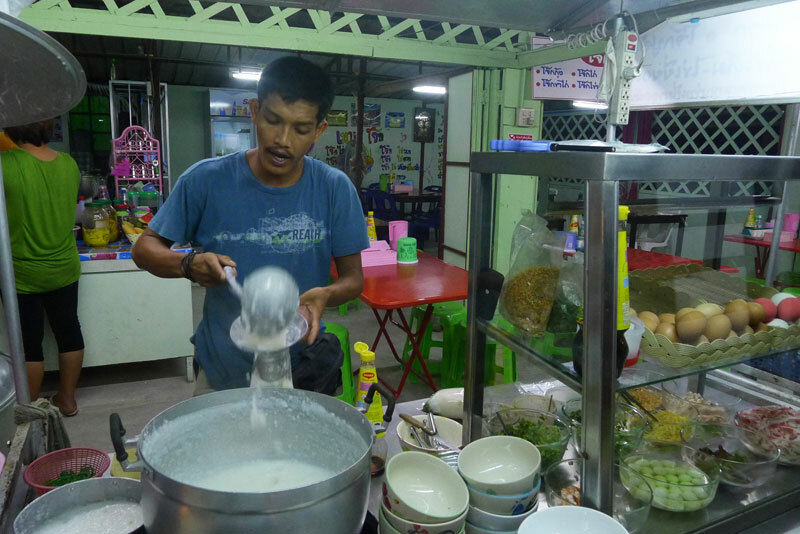 For Thai diners, the joke rice porridge is a wonderful and popular supper, eaten piping hot late at night, in the cool of the evening. Joke is a different kind of porridge than khao tom (boiled rice), which is also eaten late as a supper. Instead of whole rice being boiled, like with khao tom, joke is made from broken tips of rice that in the cooking dissolve almost completely into a glutinous paste. The ingredients of this nutritious hot thick soup include pork or chicken stock, plus a flavoured paste made from fried garlic, fish sauce, pickled vegetables, finely-diced fresh ginger and fresh coriander leaves. Some shops also add a dash of aromatic sesame seed oil and pepper. Known as congee in Chinatowns worldwide, Chinese diners like to add cooked pieces of pork meat and intestine into the boiling soup, and some also stir in a raw egg just before serving. But the Nurisa Joke stand is Muslim. So instead of pork, you can choose to add chicken, boiled quail eggs and a salted egg cut in half, at B25 for a big bowl. The more adventurous can try adding a halved 100-year-old egg, dark and jelly-like, matured for a time like European cheese, but in a mixture of rice husk, salt, lime and clay, albeit not for quite as long as 100 years. Disturbingly though, the Thai name for the egg is kai yeo mah (horse-pee egg).